Roth offers a full line of return stations equipped with ASME Code receivers that handle very hot condensate, 200°F to 250°F (93°C to 121°C), coming from absorption coolers, kettles and other equipment. 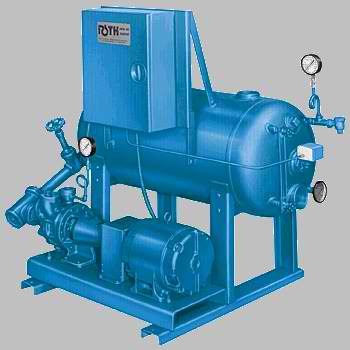 Stations are equipped with Roth special design Hot Condensate pumps, which deliver 15 to 75 psi (1.0 to 5.2 bar) discharge pressure at 1750 rpm while handling 250°F (121°C) condensate at 1 ft. (0.30m) NPSH. Stations requiring 100 to 150 psi (6.9 to 10.3 bar) of discharge pressure are supplied with 3500 rpm motors. Low silhouette design provides 3 ft. (0.91m) vertical distance from cooler outlet to receiver inlet when mounted at the same level. Simplex and Duplex units are available. Units are also available for operation at 350°F (177°C) and 400°F (204°C). You can improve the overall efficiency of your heating or steam process system by returning higher temperature condensate to the boiler with a Roth condensate pump system. Hot Condensate pumps, which deliver 15 to 75 psi (1.0 to 5.2 bar) discharge pressure at 1750 rpm while handling 250°F (121°C) condensate at 1 ft. (0.30m) NPSH. Stations requiring 100 to 150 psi (6.9 to 10.3 bar) of discharge pressure are supplied with 3500 rpm motors. Low silhouette design provides 3 ft. (0.91m) vertical distance from cooler outlet to receiver inlet when mounted at the same level. Simplex and Duplex units are available. Units are also available for operation at 350°F (177°C) and 400°F (204°C).